No two shadowbox pieces are alike, right down to the shapes of the stones. I prefer to leave the stones as organic as possible in most cases—and base the work around the shape of the stone. The turquoise in this piece is from southern Arizona, and has little black speckles in it. 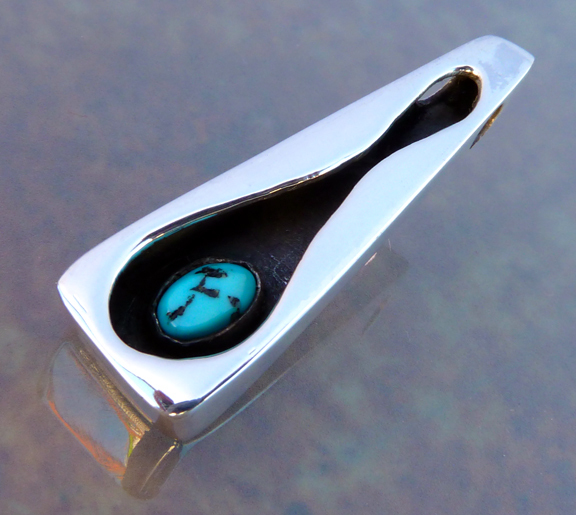 This shadowbox is a hollow form made of polished sterling and fine silver and turquoise. It is approximately 2″ long, a 1/2 inch wide at it’s widest point, and 1/4 inch deep. Signed on the back.